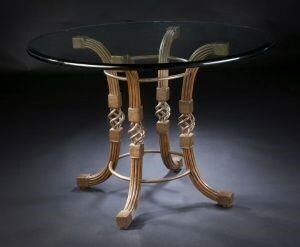 Featuring a mixed media design that includes rattan, metal, and glass materials, this dining table makes a statement. The rattan gives the table a distinct tropical vibe, while the glass top elevates the look. Perfectly sized for a smaller home or dining room, this dining table delivers high end style in a small-scale design. The Quantz 36" Dining Table at C. S. Wo & Sons Hawaii in the Hawaii, Honolulu, Oahu, Hawaiian Islands, Waikiki, Diamond Head, East Honolulu area. Product availability may vary. Contact us for the most current availability on this product. Browse other items in the Quantz collection from C. S. Wo & Sons Hawaii in the Hawaii, Honolulu, Oahu, Hawaiian Islands, Waikiki, Diamond Head, East Honolulu area.